When Samuel the bull calf was a few days old, he was rescued from a slaughterhouse. Samuels rescuers were from the Santuario Gaia sanctuary who helped nurse this little calf back to life after being so sickly. What he did after he got better was just simply cute. He sneaked into the house of the rescuers to get some cheeky cuddles. 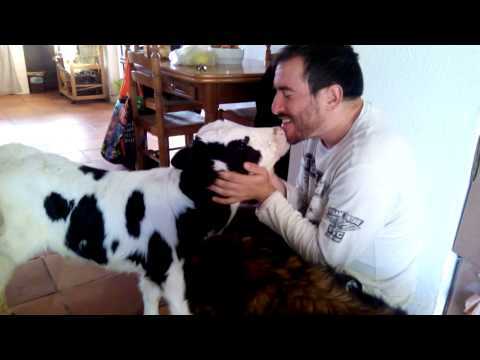 Ternero entra a la casa en busca de mimos - Calf gets into the house looking for cuddles.